The Association of Washington Cities provides elected officials training in the mechanics of city government: legal, budget & resource management, planning & development, & community engagement. 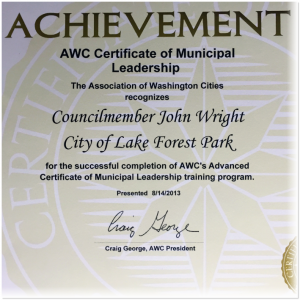 John has attended these sessions faithfully since he was first elected to the council, and he is the only currently-serving council member to have earned both the certification of municipal leadership and the advanced certification of municipal leadership from AWC. He also earned both of these certifications during his first term in office, which is an extremely rare accomplishment.